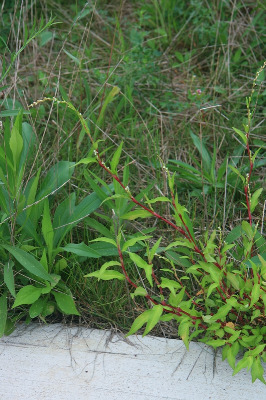 Polygonum hydropiper of Michigan Flora. Swamps, ditches, shores, marshes, streamsides, especially in slightly disturbed areas or even along roadsides. Usually considered naturalized from Europe, but sometimes thought to be at least partly indigenous in North America. First collected in 1860 in Washtenaw Co.
MICHIGAN FLORA ONLINE. A. A. Reznicek, E. G. Voss, & B. S. Walters. February 2011. University of Michigan. Web. April 22, 2019. https://michiganflora.net/species.aspx?id=2282.